Susanne Schotz is hard at work on breaking the cat code. She is a professor at Lund University in Sweden, where a long-standing research program is proving that cats do actually use vocal communication—with each other and with their human caretakers. Understanding the vocal strategies used in human-cat communication will have profound implications for how we communicate with our pets, and has the potential to improve the relationship between animals and humans within several fields, including animal therapy, veterinary medicine and animal sheltering. In The Secret Language of Cats, Schotz offers a crash course in the phonetic study of cat sounds. She introduces us to the full range of feline vocalizations and explains what they can mean in different situations, and she gives practical tips to help us understand our cats better. 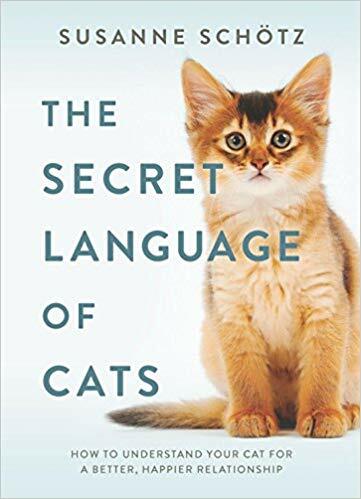 The Secret Language of Cats is a unique book that discusses cat sounds from a phonetic perspective, and gives cat owners new ways to understand what their cats are communicating. I was intrigued by The Secret Language of Cats from the cover with the adorable kitty, and from the description. I am a lifelong animal lover and grew up in a cat family. Although I have a dog now, I also love cats and am interested in reading about them. I find animal behavior in general fascinating. She also discusses other ways cats communicate -- touch, movement, spraying. The phonetic details were discussed in depth and from a scientific angle. Many are discussed with both the sound and corresponding body language. My favorite part of the book was the fond way that Susanne Schotz wrote about her own history with cats and discussed different cats she has loved. I found it very moving when she discussed older cats who passed on, and how she decided she couldn't go through that again ... but there was always another kitty (or kitties!) waiting for her. I also liked the practical chapters where she talked about specific cat questions and practical behavioral answers, i.e. Why does my cat not say anything? My cat wakes me up at night. My cat only comes to other family members, not to me. I think The Secret Language of Cats will be of great interest to cat people, and especially to anyone who wants to read about cat sounds from a detailed perspective.